The report, entitled “State of British Columbia’s Coastal Rainforest: Mapping the Gaps for Ecological Health and Carbon Storage,” found that more than two million hectares of rainforest ecosystems on BC’s coast have less than 30 percent old-growth coverage per ecosystem – the critical limit to avert species extinction. With continued clear-cut logging planned for coastal old-growth forests, BC will lose a vital asset in the fight against climate change. 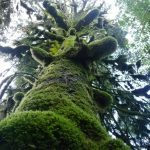 “This analysis shows that the vast majority of the most productive old-growth forests on Vancouver Island and the South Coast, largely in valley bottoms and on the lower slopes where the largest trees grow, are at high risk for major species extinctions,” says Tara Sawatsky, Wilderness Committee forest and marine campaigner. Ken Wu, the Wilderness Committee’s Victoria campaign director, is currently in Copenhagen to draw worldwide attention of delegates and international environmental groups to the need to protect B.C.’s old-growth forests in order to slow climate change. 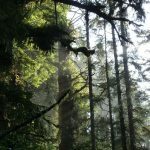 “The international community here will be amazed to learn about how spectacular BC’s coastal old-growth forests are, and the incredible amounts of carbon they store per hectare – virtually unmatched in the world – and about the plan to continue liquidating the last unprotected ancient forests on Vancouver Island,” says Wu. The report highlights the potential of BC’s coastal forests to become a vitally important part of a low-carbon economy, providing jobs, carbon sinks and species habitat. It also calls for urgent policy reform modelled after the successful land use plan in the Great Bear Rainforest. “This report sheds light on the link between taking the precautionary approach to managing old growth forests and their critical roles as carbon sinks. In an era of climate change, the implementation of Ecosystem-Based Management in the Great Bear Rainforest offers a potential model for other areas in BC,” said Eduardo Sousa of Greenpeace.